Raspberry Pi Zero, Pi 1 & Pi 2 will be OK.
Security and accessibility is the main concern in today's world. We always try to keep our house secure and at the same time we want to make our home devices easy accessible even from the remote location. Think, you have a guest waiting at your front door and you are outside of the home. But you want to allow him inside your house. Or you are doing a very important task in your desk and want to know who came at the front door without leaving your seat. Just imagine! Alexa can do everything for you!! Yes, I made an intelligent door lock which can recognize a guest, greet the guest with name, notify the owner about the guest and remember an unknown guest. House owner can know the name of the guest by asking Alexa like "Alexa, who is at the front door?" You can also ask Alexa to open or close the door. I made a custom Alexa Skill for this. Using the skill you can know your guest and welcome him inside your house without leaving your seat. In this tutorial I will show you how you can make such intelligent device yourself. I am assuming you have some previous experience with Arduino & Raspberry Pi and some basic knowledge in Python programming. In this project, I used several AWS services (e.g. 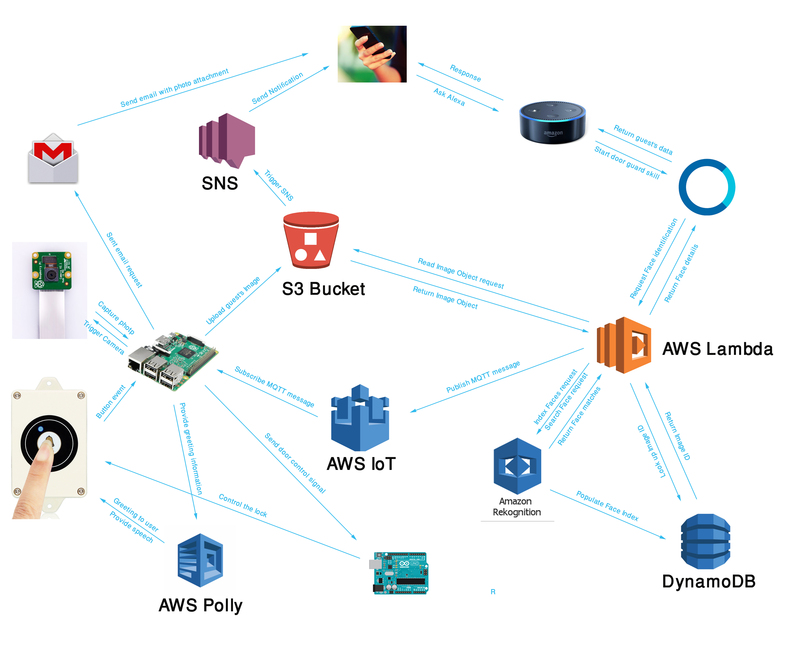 IoT, Lambda, Bucket, Polly, SNS). So, you will be required an Amazon AWS account. Before going into detail instructions let me first explain how it works. 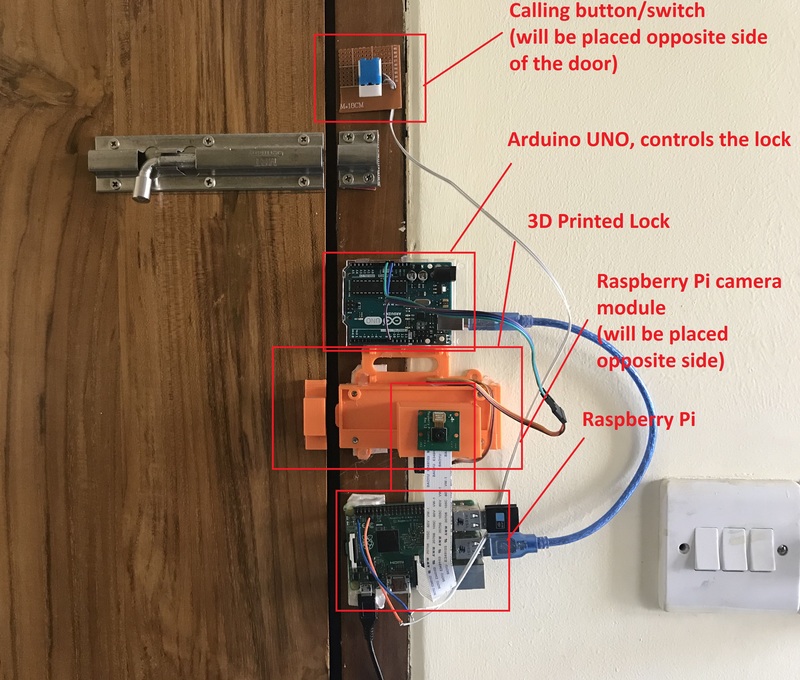 I am calling this device Intelligent Door Lock and for making the device I used a Raspberry Pi with official camera module and an Arduino with a servomotor for controlling the lock. It takes a picture of the guest and upload it to AWS S3 Bucket and S3 Bucket trigger a SNS notification to a specific topic. It sends an email with the photo to the house owner. It sends a greeting text to AWS Polly and then play the audio greeting for the guest returned by the Polly. Alexa, ask door guard who came? Read the image uploaded to the S3 Bucket. Sends a face search request for the image to AWS Rekognition. After getting face matches result return by Rekognition, Lambda search for the name to AWS DynamoDB and return the name to the Alexa if found. 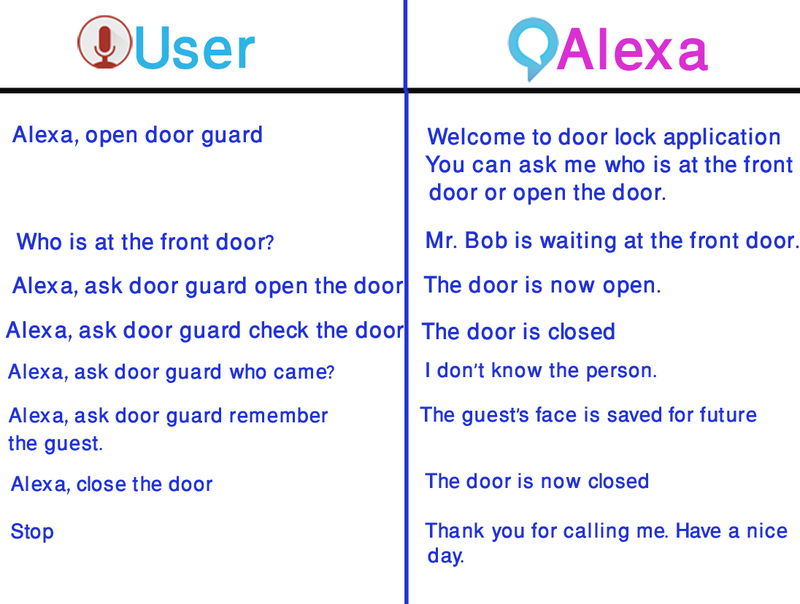 Alexa provides the name to the house owner and house owner again call the Alexa to open the door for the guest. In this case Lambda sends a open door command to AWS IoT to a specific topic. Raspberry Pi receives this command and sends to Arduino using serial port. Arduino control the lock accordingly. The following block diagram can helps for better understanding. Writing program for uploading Images of knows persons and storing Face Index in the DinamoDB table. Making Custom Alexa Skill and writing code for Lambda function. Prepare your Raspberry Pi with latest Raspbian operating system and get ready to do some programming. If you are new in Raspberry Pi read this how to get started using Raspberry Pi guide. You can plug a mouse, keyboard, and monitor into your Pi or access it using SSH client like PuTTY. To know how to connect with PuTTY you may read this tutorial. Details of AWSToTPythonSDK is here. You need to configure AWS CLI with Access Key ID, Secret Access Key, AWS Region Name and Command Output format before getting started with it. Follow this tutorial for completing the whole process. Amazon Rekognition is a sophisticated deep learning based service from Amazon Web Services (AWS) that makes it easy to add powerful visual search and discovery to your own applications. With Rekognition using simple APIs, you can quickly detect objects, scenes, faces, celebrities and inappropriate content within images. Amazon Rekognition also provides highly accurate facial analysis and facial recognition. You can detect, analyze, and compare faces for a wide variety of user verification, cataloging, people counting, and public safety use cases. Amazon Rekognition is based on the same proven, highly scalable, deep learning technology developed by Amazon’s computer vision scientists to analyze billions of images and videos daily, and requires no machine learning expertise to use. Amazon Rekognition is a simple and easy to use API that can quickly analyze any image or video file stored in Amazon S3. Amazon Rekognition can store information about detected faces in server-side containers known as collections. You can use the facial information stored in a collection to search for known faces in images, stored videos and streaming videos. Amazon Rekognition supports the IndexFaces operation, which you can use to detect faces in an image and persist information about facial features detected into a collection. The face collection is the primary Amazon Rekognition resource, each face collection you create has a unique Amazon Resource Name (ARN). You create each face collection in a specific AWS Region in your account. The above command creates a collection named as guest_collection. Next, we create an Amazon DynamoDB table. DynamoDB is a fully managed cloud database that supports both document and key-value store models. In our example, we’ll create a DynamoDB table and use it as a simple key-value store to maintain a reference of the FaceId returned from Amazon Rekognition and the full name of the person. For the IndexFaces operation, you can provide the images as bytes or make them available to Amazon Rekognition inside an Amazon S3 bucket. In our example, we upload the images (images of the known guest) to an Amazon S3 bucket. Although all the preparation steps were performed from the AWS CLI, we need to create an IAM role that grants our function the rights to access the objects from Amazon S3, initiate the IndexFaces function of Amazon Rekognition, and create multiple entries within our Amazon DynamoDB key-value store for a mapping between the FaceId and the person’s full name. For the access policy, ensure you replace aws-region, account-id, and the actual name of the resources (e.g., bucket-name and family_collection) with the name of the resources in your environment. Now, attach the access policy to the role using following command. We can almost configure our AWS environment. We can now upload our images to Amazon S3 to seed the face collection. For this example, we again use a small piece of Python code that iterates through a list of items that contain the file location and the name of the person within the image. Before running the code you need to install Boto3. Boto3 is the Amazon Web Services (AWS) Software Development Kit (SDK) for Python, which allows Python developers to write software that makes use of services like Amazon S3 and Amazon EC2. You can find the latest, most up to date, documentation at Read the Docs, including a list of services that are supported. Now, run the following python code to upload the images into S3 Bucket. Before running the code be sure that you keep all the images and the python file in the same directory. Now, add the Face Index to AWS DynamoDB with full name for every image using the following python code. # Note: you have to create the collection first! # Print response to console. Once the collection is populated, we can query it by passing in other images that contain faces. Using the SearchFacesByImage API, you need to provide at least two parameters: the name of the collection to query, and the reference to the image to analyze. You can provide a reference to the Amazon S3 bucket name and object key of the image, or provide the image itself as a bytestream. In the following example, I used following code in Lambda function to to search face by taking the image from S3 Bucket. In response, Amazon Rekognition returns a JSON object containing the FaceIds of the matches. Using the face ID it retrieves the full name. 1. Sign in to https://developer.amazon.com and click on Create Skill. 5. Drag and drop the json file attached in the code section or paste the code in the editor window. 6. Save and Build the model. Your custom skill is almost ready. We will back here again after creating a Lambda function. 3. Select the LambdaRekognitionRole we created using aws cli and click on Create function from the right bottom corner. Alexa Skills Kit will be added with your Lambda function. 5. Go to the top bottom corner and copy the ARN in your clipboard. 10. Configuration for Lambda function is almost complete. 13. Go to the Lambda function again from AWS console and from the code section choose Upload a ZIP file, browse the zip file you created and then click on Save. Your Custom Skill with a Lambda function is now ready to test. Raspberry Pi is connected with a camera module. 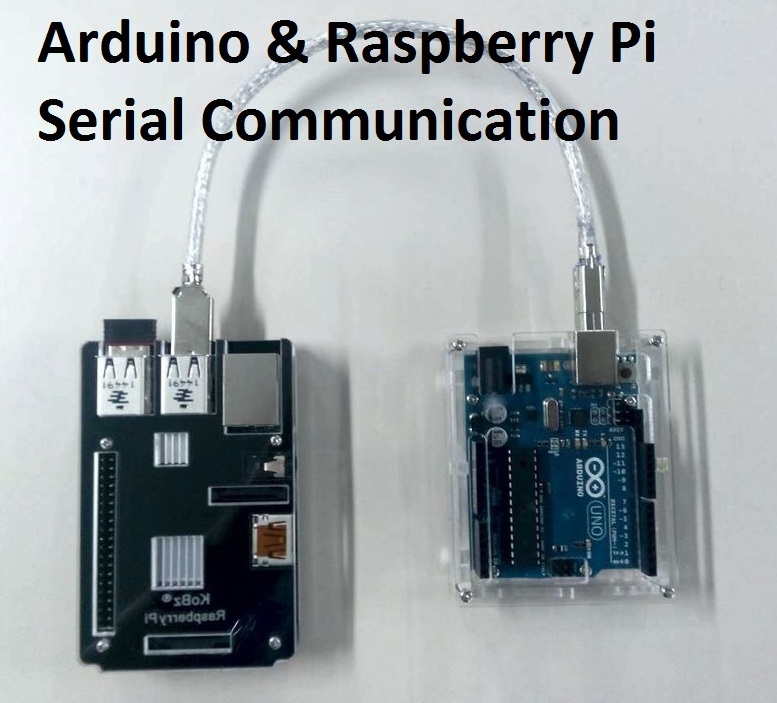 Raspberry Pi sends data to Arduino using serial cable. I short Arduino cable was used to connect Arduino with Raspberry Pi. A test setup was made for primary testing either it is working perfectly or not. After primary testing I setup all the devices in a door using some hot glue. This setup is for demonstration purpose only. To make the demonstration easy I place all the components in the same side of the door. Practically the camera and the button switch will be outer side of the door. Here, I did not attached any speaker. A speaker is required to play the greetings for the guest. The demo lock was printed using a 3D printer. To get full design of the lock see my previous tutorial. Special thanks to Mr. Christian Petters for his nice tutorial Build Your Own Face Recognition Service Using Amazon Rekognition. It was really helpful and I copied some instructions and commands directly from his writing. This GitHub link also helped me to develop program. 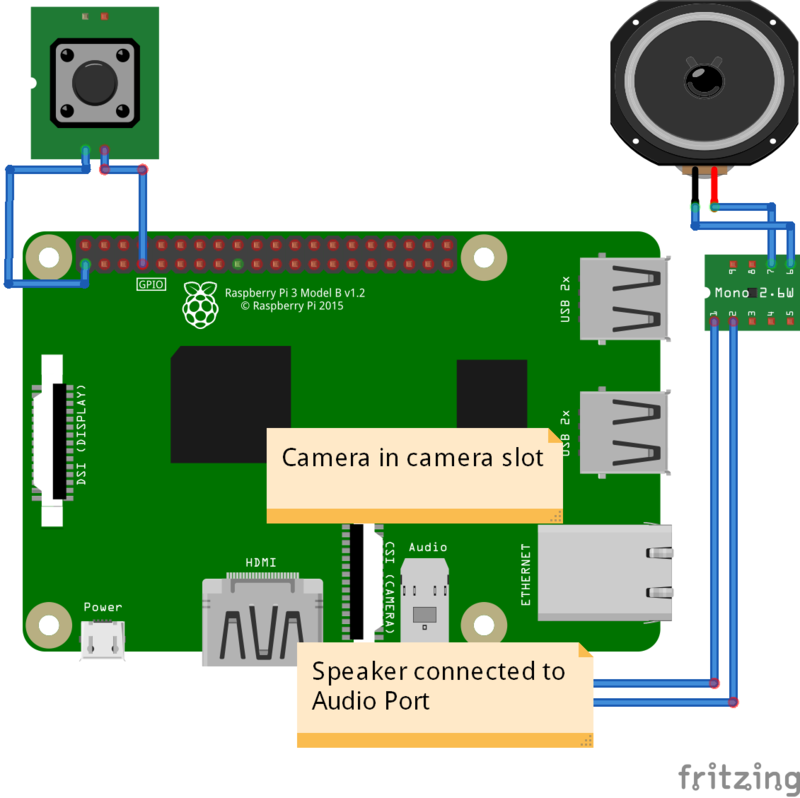 Raspberry Pi is equipped with a camera module, audio amplifier, and a button switch. This python code snippet captures a photo, upload it to S3 bucket, sent the photo to your email address with a notification. fromaddr = "Put From Which Email"
toaddr = "put to which email"
body = "A new guest is waiting at your front door. Photo of the guest is attached." This python code snippet receives message from AWS IoT, sends command to Arduino and produce the greeting message for the guest. Use this JSON code for the Alexa Skill. "Is the door open or closed"
This sample demonstrates a simple skill built with the Amazon Alexa Skills Kit. etc.) The JSON body of the request is provided in the event parameter.
""" Called when the session starts """
""" Called when the user ends the session. # that is not understood, they will be prompted again with this text. "Who is at the front door?" speech_output = "The door is now open." speech_output = "The door is now closed." speech_output = "The door is open." speech_output = "The door is closed." speech_output = "The guest is waiting with smiling face." speech_output = "The guest's details is stored for next time." speech_output = "I dont know the person." speech_output = guest + " is waiting at the door." #speech_output = " is waiting at the door." speech_output = "Thank you for calling me. Have a nice day!" 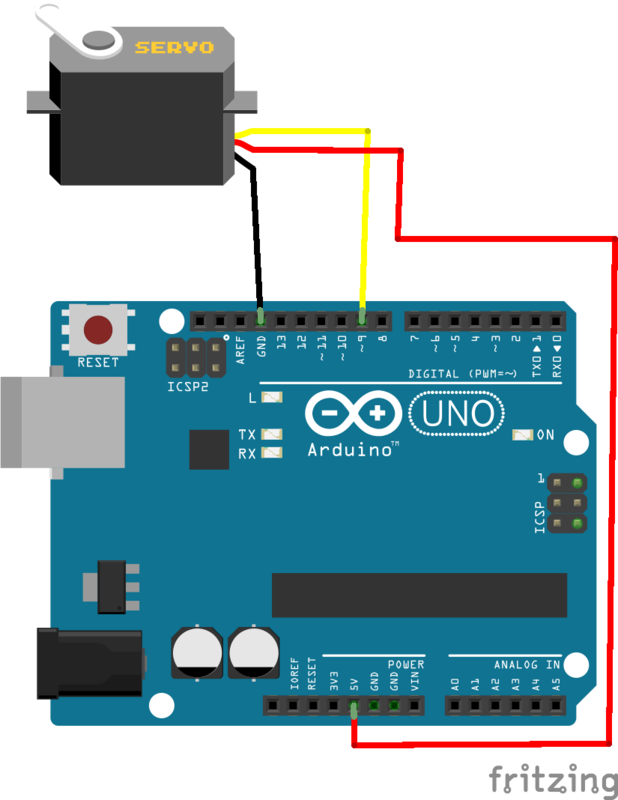 This Arduino sketch is used for receiving the command for controlling the lock. The command is receiving using USB serial cable. A servo motor is used to control a 3D printed lock. This code snippet captures a photo of the guest automatically when he presses the calling button and upload the photo to the S3 Bucket and send a notification to the house owner. Use this code to index a face from S3 Bucket and store the index in DynamoDB with the full name. Use this code snippet to upload multiple images with full name to S3 Bucket.